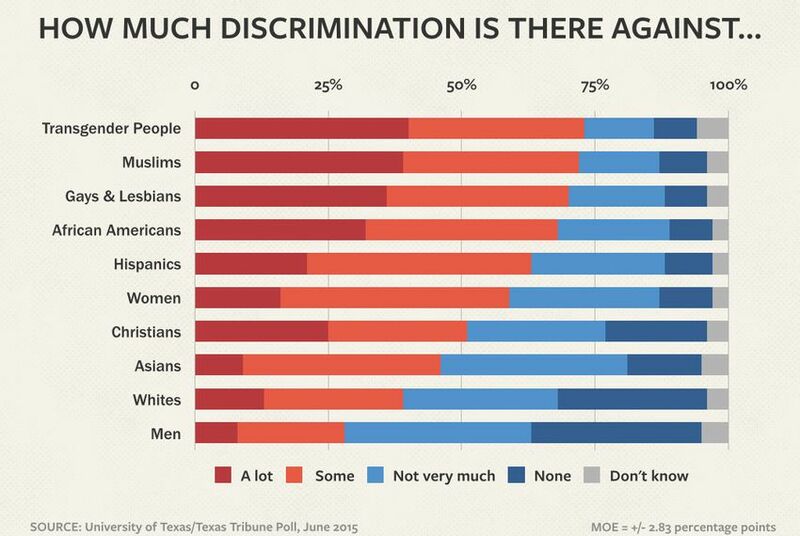 Texans believe discrimination is a hard fact of life in the U.S., but they have dramatically different views on what groups fall victim to it, according to the latest University of Texas/Texas Tribune Poll. Many groups face discrimination in the U.S., Texas voters say, but they don’t always agree on who faces it most, according to the latest University of Texas/Texas Tribune Poll. 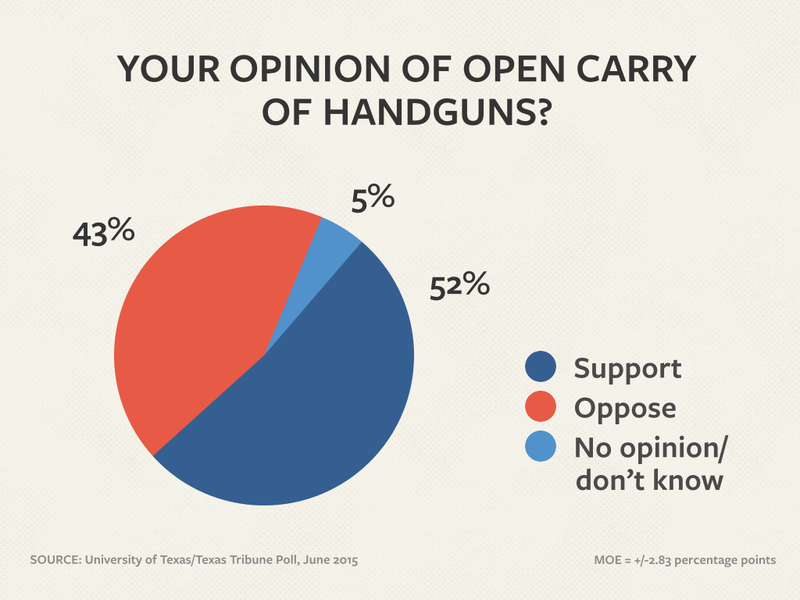 And in the wake of months of gun violence, Texans remain supportive of looser restrictions on where and when people can carry handguns in the state, the poll found. Transgender people, Muslims, gays and lesbians, and African-Americans — in that order — face the most discrimination, Texas voters say. They’re followed, in order, by Hispanics, women, Christians, Asians, whites and men. But the differences from one group of respondents to another were very different. “There is an enormous divide here,” said Daron Shaw, co-director of the poll and a government professor at the University of Texas at Austin. While 72 percent of all respondents said there is either “a lot” or “some” discrimination against Muslims in the U.S., only 49 percent of voters who identified themselves as Tea Party Republicans thought so. And 70 percent of all respondents said gays and lesbians face discrimination, but only 45 percent of Tea Party Republicans and 45 percent of Hispanics thought so. More than half of respondents — 52 percent — said Christians face discrimination, a view shared by 68 percent of Republicans and only 30 percent of Democrats, by 60 percent of registered voters over 65 years of age and only 39 percent of voters under 30. While 39 percent of male voters said men are discriminated against, only 18 percent of female voters agreed. The men were split 49 percent to 48 percent on whether women face discrimination; 67 percent of the women said they do. Rural voters (55 percent) and Tea Party Republicans (62 percent) said that white people are discriminated against in the U.S. Only 40 percent of all voters thought so. Texas lawmakers voted in the recently completed legislative session to allow Texans with licenses to openly carry their handguns, a policy decision that finds favor with 52 percent of the state’s registered voters; 43 percent oppose that law. Those overall numbers hide big partisan differences: 75 percent of Republicans favor open carry while 73 percent of Democrats oppose it. The genders are split, too: 60 percent of men favor open carry while only 45 percent of women do. Lawmakers also decided to allow concealed handguns on state college and university campuses, so long as the people carrying them are licensed. They also decided the schools should be able to prohibit handguns in some buildings and areas on their campuses. That policy appears to fit nicely with voter opinion. 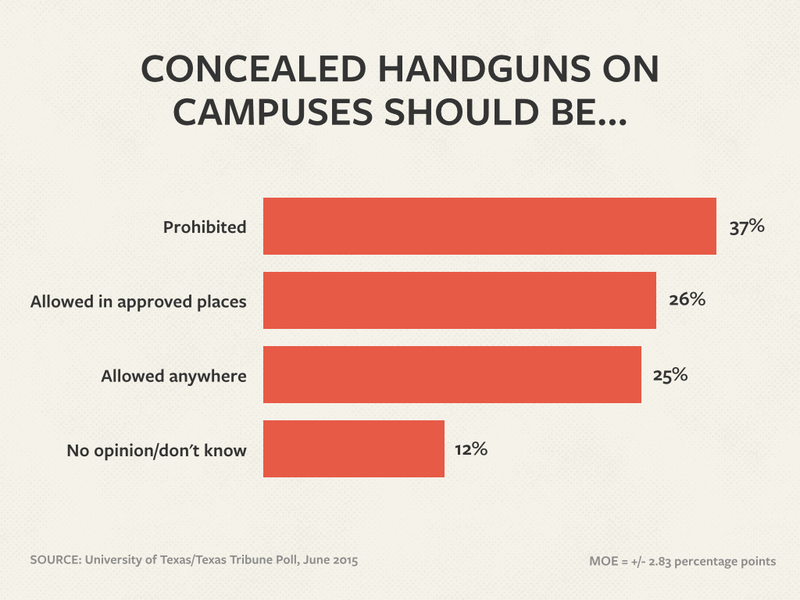 While 37 percent of voters are against campus carry, 25 percent would allow handguns anywhere on campus, and another 26 percent would allow it if the schools could determine whether they should be allowed. This is one of several stories on the latest University of Texas/Texas Tribune Poll. Previously: The presidential primaries. Also today: The mood of the state. Tomorrow: Social issues.